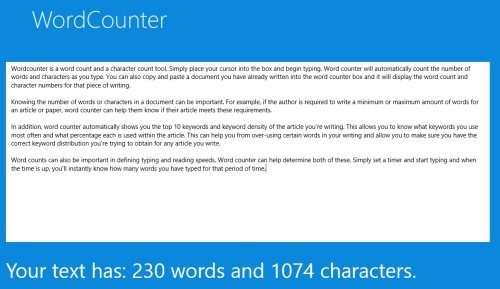 Word & Character Counter is a free Windows 8 word counter app that lets you find out the number of words & characters are there in your paragraph or article. All you need to do is simply place you cursor into the rectangular box and start typing your content. Else, you can also just copy the entire content you have already written and paste it in the box.. now, click on ‘Count button. The app will bring you the number of words and number of characters that are there in that piece of writing. It, sometimes, become important to know the number of characters and words in a paragraph, or a document. For example, if you are a writer and you require to write an article containing a minimum or maximum number of words, then this word count comes into existence. It helps you to meet your requirements. Word & Character Counter app is a simple and easy-to-use counter tool that is available at zero coat in its app store. Go ahead and download Word & Character Counter app in Windows 8 now. 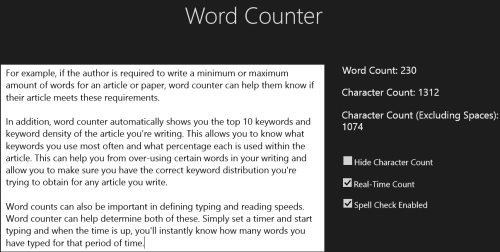 Simple Word Counter is another Windows 8 word counter app that lets you count the number of words and characters that the pasted paragraph contains. Also, this word counter app for Windows 8 comes with an ability to count the number of occurrences of various words in that piece of writing. All you need to do is just type or paste a paragraph in the text input box and click on ‘Show Result’ button. You will find the number of words and characters at the bottom and the number of occurrences of various words at the right-side of the screen. Now, to clear out the text input box, just click on ‘Clear Input’ button. It’s a good utility counter tool for Windows 8 where you can complete your article in the required word limit. 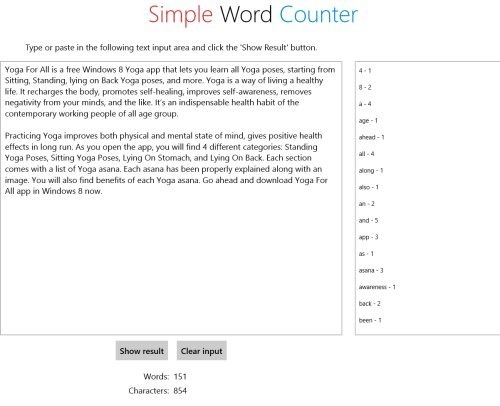 Go ahead and download Simple Word Counter app in Windows 8 now. Also, check out our posts on Spelling Apps, Apps To Ask Questions, and Language Translator Apps. WordCounter is good utility counter tool for Windows 8 where you can easily count the number of words and characters in a document or an article. 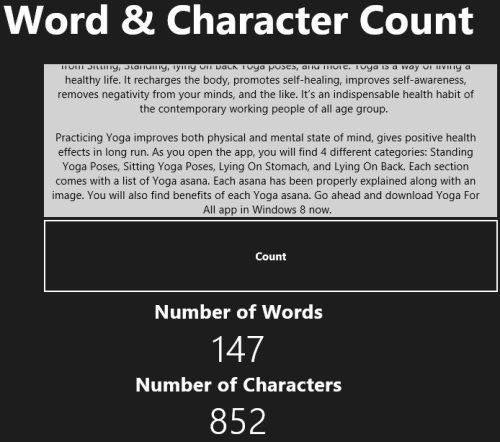 You can use this Windows 8 word counter app while writing articles, essays, research papers, etc. No matter, if the content or document is small or large.. WordCounter supports large documents very well. What I really liked about this word count app is its beautiful interface.. yup, the app has a beautiful blue background and the home page has test input box where you need to input your content and it will automatically bring out the result at the bottom of the screen. Go ahead and download WordCounter app in Windows 8 now. Ending my post with Word Counter app that allows you to count the words and characters that a specific paragraph or article contains. Also, the app can compute the character and word counts in real-time. Well.. real-time word counting means that the app will update the number of words or characters each time you type something. In addition, there are options to hide character count, and real-time count. This Windows 8 word counter app also comes with spell-check feature and you can easily enable or disable spell-check option. As you open the app, you will find text input box where you need to type or paste the paragraph and at the right-side of the screen, you will find options including Word Count, Character Count, Character Counter (Excluding Spaces), Hide Character Count, Real-Time Count, and Spell Check Enabled. Go ahead and download Word Counter app in Windows 8 now.